Called by many the hardest heavyweight puncher in history, Earnie Shavers made his pro debut in November 1969, with a second round KO over one Silas Johnson. Johnson became the first of a number of fighters to be knocked flat or stopped, that number would eventually total 67. Shavers didn’t waste any time following up his first victory – he fought another two times in the same week in November. However, the third of these fights was his first loss, a points defeat over six rounds to a guy named Stan Johnson. Refusing to be discouraged, Shavers reeled off ten straight KOs after this setback. Then came a loss that would reveal one of the weaknesses that this huge puncher would have throughout his career- a suspect chin. Earnie was stopped for the first time against Ron Stander in round five. It would be three more years before Earnie lost again and despite the loss to Stander, he was about to enjoy a very successful roll. In 1973, Earnie, by now a rising contender, scored a KO win that in hindsight was far more impressive than initially thought. He knocked out the incredibly crafty Jimmy Young – the first man to do so, and one of only two men ever to stop Jimmy (Gerry Cooney being the other). This was a superb win and one indicative of just how dangerous Earnie was in the ring. He followed this up with arguably his finest ever victory. He crushed former champ Jimmy Ellis in the very first round. Earnie looked very shaky himself before dropping Ellis for the count, but claimed later he was simply faking so as to draw Ellis in. It worked and Shavers became a serious threat to reigning champion George Foreman. What a pity these two would never meet. What a slugfest that fight would have been. Unfortunately, Earnie lost some momentum after his great win over Ellis. He was stopped again in one round by Jerry Quarry. Once again his weakness was exposed. Earnie may have been a lethal puncher, but his chin left a lot to be desired. If an opponent could get past the early rounds this, as well as Earnie’s suspect stamina, gave them a chance for victory. Shaver’s high ranking dipped somewhat due to the humbling loss to Quarry. He was far from finished though. After his loss to Quarry, he scored a first round win the following year over Roy Wallis and then, after a points defeat to Bob Stallings, he gave Jimmy Young a return bout. Young had evidently learned a fair amount since his loss to Shavers and this time he knew enough to fight to a draw, showing the cagey skills that would one day allow him to go the full fifteen with Ali. Earnie’s career carried on in its up and down phase the following year when he fought the huge Ron Lyle. He had Lyle down in the second round, but couldn’t keep him there. Lyle, showing some of the same grit that would be on display in his incredible brawl with George Foreman four months later, hung in there long enough for Earnie to tire, stopping him in the sixth round of an entertaining fight. At this point it was clear to all that while Shavers’ power was something to behold, he was far from unbeatable. However, he was by now a genuine crowd pleaser. His kill or be killed style thrilled the fans. And his most famous and memorable fights were still to take place! In 1977, Shavers scored five victories after the wild affair with Ron Lyle, and was given his first shot at the title. He was to face the incomparable Muhammad Ali. By this stage in his career however, Ali was showing some serious wear and tear. Looking back, it really was a crazy move for the aging Ali to sign to defend against the murderous punching Shavers. The fight didn’t turn out quite like most thought it would beforehand, however. From somewhere, Earnie found the stamina to fight for fifteen long rounds and equally impressively, Ali was able to go to the well one more time to pull out a gruelling points win. Ali really had to take some bombs though. He was badly hurt on a number of occasions and only his legendary chin allowed him to survive. At the end it was mighty close, but the judges sided unanimously with The Greatest. 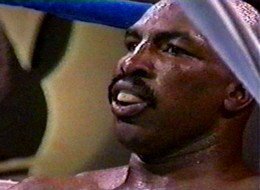 Ali lovingly dubbed Shavers “The Acorn” in the build-up to the fight because of Earnie’s shaved dome and to this day the nickname has stuck. Ali would only manage one more win after his war with “The Acorn,” his return bout with Leon Spinks. After the confidence boost of proving he could go the full fifteen rounds, as well as giving the best heavyweight in history such a hard fight, Earnie entered the year 1978 feeling good. He fought fellow contender Larry Holmes, in an eliminator for the WBC title, and was as determined as ever to be champion. But Larry knew too much for him and won a wide points verdict. These two would meet again though. At this time, Ken Norton was felt by many to be one of the best big men in the world. He had lost a razor thin decision to Ali in 1976 and also gave Larry Holmes a gruelling distance fight – in a bout that contested the WBC title – in June of 1978. Norton was no match for Shavers, however. In their fight in March of 1979, Earnie scored another great win – destroying Norton in a single round. This superb win earned Earnie a second crack at Holmes- who was now WBC king. And this time he did a bit better. He cracked Holmes with a huge right in the seventh and Holmes went down in a manner that would have signaled certain defeat for many a fighter. Larry wasn’t simply put on the canvas, he was almost sent right through it! How he got up and survived, no one, least of all Shavers, will ever know. Earnie’s chance at winning had passed as Larry regained the initiative and stopped him on cuts in round eleven. Shaver’s days as a top contender were over. He carried on until 1987, winning a few and losing a few – to men like Randall “Tex” Cobb- a loss, Joe Bugner- a win and James “Quick” Tillis- a loss. He retired in the summer of ‘87 after a win over Larry Simms, only to make a shocking return to the ring in 1995! Aged 50, Earnie managed a win over a guy named Brian Morgan, but was then was stopped in two rounds by somebody called Brian Yates. Shavers’ final pro record reads – 72 wins, 13 defeats, 1 draw – with 67 KOs.